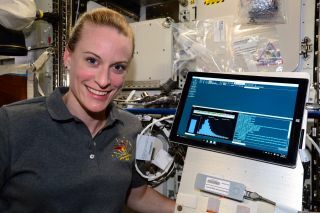 NASA astronaut and biologist Kate Rubins successfully sequenced DNA in the microgravity of the International Space Station using a small device called MinION. NASA astronauts are opening new doors in the worlds of science and medicine by sequencing DNA in all sorts of extreme environments, including, for the first time, the microgravity of the International Space Station. But space is not the only extreme environment in which DNA is being tested. In July, "aquanauts" living 62 feet (19 meters) below the surface at NASA's underwater habitat called Aquarius sequenced DNA underwater for the first time ever. They used the same device as Rubins. The band of aquanauts — including members of NASA and the European Space Agency (ESA) — participated in a 16-day underwater expedition known as the NASA Extreme Environment Mission Operations (NEEMO) 21. The aquanauts first tested the palm-size MinION DNA sequencer, built by Oxford Nanopore Technologies, underwater to "minimize unknowns and see how the device worked in various extreme environments," NASA officials said in a statement. ESA astronaut Matthias Maurer (photographed here) was a member of the NEEMO 21 crew that used the MinION device to sequence DNA underwater. Now that the device has successfully been used on the orbiting lab, MinION has broader potential uses, such as diagnosing illness in astronauts or identifying microbes growing on the space station. "A space-based DNA sequencer would be an important tool to help protect astronaut health during long-duration missions on the journey to Mars, and future explorers could also potentially use the technology to identify DNA-based life-forms [found] beyond Earth," NASA officials said in the statement. In addition, astronauts could sequence DNA to learn more about how space radiation might affect the genes of Earthly organisms or the degree to which the weightlessness of microgravity causes bone and muscle degeneration, Rubins said in a live interview with ABC News on Aug. 23. When using the MinION sequencer for the first time in space, Rubins analyzed prepared DNA samples from a mouse, a bacterium and a virus, while identical samples were simultaneously sequenced by researchers on Earth. This experiment was designed specifically so that spaceflight conditions were the only variable, NASA officials said. In the results, the sequences taken in microgravity and on Earth appear to match up, the officials said. However, using the MinION in microgravity can be challenging, Aaron Burton, NASA planetary scientist and principal investigator of the DNA sequencing project, said in the statement. "In space, if an air bubble is introduced, we don't know how it will behave," he said. For comparison, when air bubbles form in a fluid being studied on Earth, they rise to the top of the liquid solution and can be removed by centrifuge. The biggest concern surrounding the use of MinION on the space station is that air bubbles could damage microscopic pores, or nanopores, embedded in membranes inside the device, Burton explained. The recent experiment conducted by Rubins also served as a test of whether the MinION device could function properly in the microgravity of the space station. The experiment also checked whether MinION could make the trip there; while the device is small enough to travel to the orbiting lab, it is fragile and susceptible to damage caused by vibrations during launch. Many other factors could also complicate the process, and NASA will be looking for additional errors that may arise in future experiments, officials said in the statement. So far, however, the small device has proved to be a strong spacefarer and performed as expected when exposed to several variables — including differences in temperature, humidity and pressure — when used underwater at Aquarius, the researchers said. The next phase of research on board the space station will involve not only sequencing samples of DNA, but also preparing those samples in space, rather than on the ground. "Onboard sequencing makes it possible for the crew to know what is in their environment at any time," Sarah Castro-Wallace, MinION project manager and NASA microbiologist, said in the statement. "That allows us on the ground to take appropriate action — do we need to clean this up right away, or will taking antibiotics help or not? We can resupply the station with disinfectants and antibiotics now, but once crews move beyond the station's low Earth orbit, we need to know when to save those precious resources and when to use them."